Currently homebase for CLUB KARATE! PHOTOS and DETAILS posted below Floorplan. The Shed Multi-Use Building: approx. 4,343 sq. ft. Studio 2: 1,065 sq. ft; 9' ceiling; vinyl tiles over concrete; 4' mirrors between doors to hallway; 7' cabinet w/sink; hot water heater under counter; power utility box & fiber optic hook up in power closet in corner. Hallway: 9' ceiling; vinyl tiles over concrete; storage under stairs; changing room; 2 restrooms, 1 is handi-capped accessible. 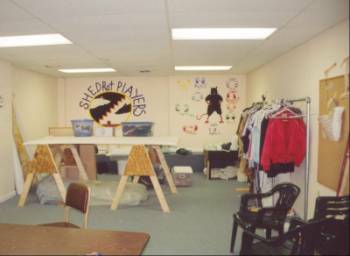 Studio 3: 854.25 sq.ft; 8' ceiling, padded vinyl flooring over wood; 6' mirros along wall by stairs; built-in shelves along wall by outside exit; storage closet. Studio 4: 468 sq.ft; 8' ceiling; carpet over wood; washer/dryer hook-ups. 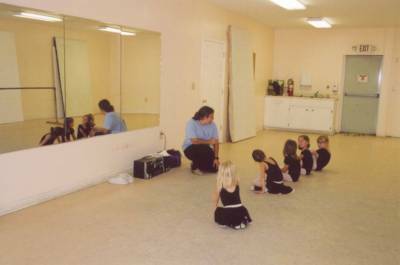 Club Karate Classes; approximately 1,460 square feet. 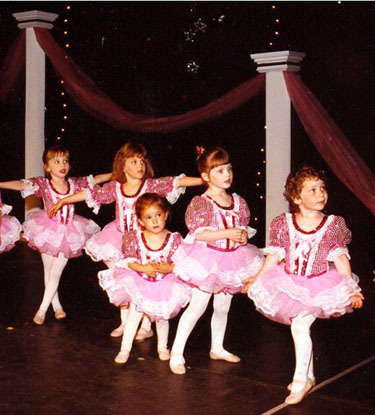 Tiny tots at dress rehearsal, Mother's Day weekend, May 1997. Studio 2: approx. 1,065 square feet. The back half of the room: mirrors on left wall, sink/cabinet in back. 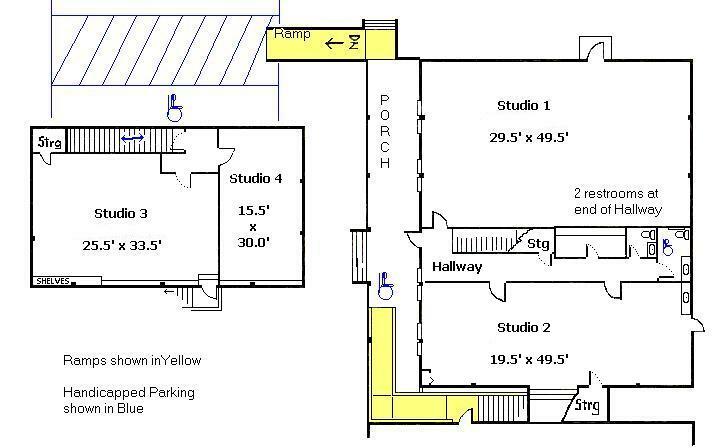 Studio 3 - on 2nd Floor; 854 sq ft. Studio 4, 2nd Floor; approx. 468 sq ft.
located at the top of the stairs; W/D hook-ups.